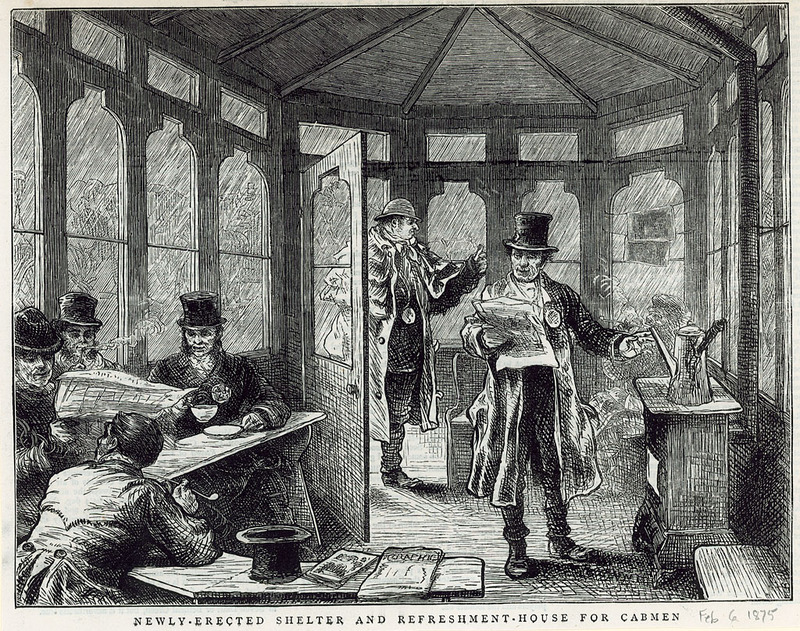 This is the history of the Green Cabmens’ Shelters, from their early beginnings with an idea by a Fleet Street editor and help from donations given by the great and the good. A charity which started with just one in St. John’s Wood and would go on to eventually erect over 60 around London. In January 1875, Captain Armstrong, ex-soldier and editor of The Globe a newspaper based in Fleet Street, who lived in St. John’s Wood, sent his manservant out into a raging blizzard to engage a taxi to take him to Fleet Street. The manservant eventually found the cabbies enjoying each other’s company in a local hostelry, each with varying levels of intoxication. Returning a full hour later and soaked to the skin, the good captain – slightly miffed – asked his manservant why he had been so long to be told that although there were cabs on the local rank all the cabmen were in no condition to take him to Fleet Street. Now at that time the Temperance Society was at the peak of its powers, and excessive intake of alcohol was frowned upon. So in line with the Victorian ethos of public service, Captain Armstrong decided to do something about this and came up with the idea of dedicated shelters for cabbies’ use close to the cab ranks. With the assistance of the 7th Earl of Shaftesbury, then aged 73, and a few like-minded philanthropists, they founded the Cabmens’ Shelter Fund which took up offices at 19 Buckingham Street, just off the Strand. The aim was to build and run shelters at the busiest cab stands within a six-mile radius of Charing Cross. Each shelter would have an attendant and provide ‘good and wholesome refreshments at moderate prices’. This would both address the problems of food and shelter and, more importantly, reduce the cabbies’ temptation to indulge in alcohol. No class of men, in London and other large towns, minister to the ease and comfort of others more directly than our cabmen, while exposing themselves to much bodily hardship. They must be out in all weathers, and at all hours, both of day and night. We may sometimes disagree with them about a six-pence. Their earnings are very precarious, as it depends on chance whether they find themselves, at the busy time, in the better parts of town; and they are obliged to pay a fixed sum daily for the use of the horse and cab, whether or not they receive the amount in passenger fares. These considerations should lead the public to regard cabmen with some forbearance in case of disputes upon what is, after all, frequently a matter of opinion rather than of positive knowledge, the distance from one point to another; through it would be well for the law to be so amended as to prevent those disputes. It might be enacted, for instance, that the fare should be one shilling within any of the postal districts, eighteenpence for going out of one postal district into another, two shillings for passing across the second postal district into a third, and so on, with easy reference to the postal map of London hung up inside every cab. We do not believe that cabmen, in general, are more disposed to cheat and tell falsehoods than any other class of tradesmen or professional gentlemen or directors of joint-stock companies, in their way of business. They have, at any rate, a claim upon our sympathy, when they sit for many hours in the pouring rain at the street cabstand, waiting for a fare; unless they venture to take refuge inside, making the cushions periously damp for the next coming passenger with the drippings of a soaked overcoat; or else desert the vehicle in their charge for the bar of the opposite public-house, where they may drink more than is good for their health or behaviour. We are glad, therefore, to observe that a society has been formed, under the presidency of Lord Shaftesbury and the Hon. 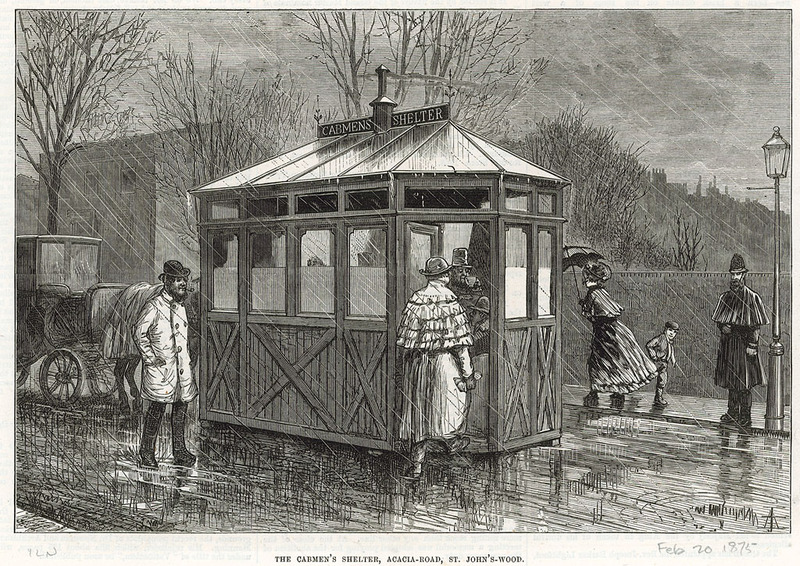 Arthur Kinnaird, to establish movable huts or pavilions, with glass sides, for the cabmen to take shelter in, at their stands, during heavy rain, snow, or hail, or other inclement weather. It would, indeed, be still better if the Metropolitan Board of Works or the Vestries could devise the erection of some kind of iron and glass sheds for cabs, horses, and drivers together, where the road has sufficient width to spare. But the mere glass-sided box for cabmen is a desirable institution. The committee for promoting this object consists of Lord Aveland, Captin G. C. Armstrong, Mr. Evelyn Charrington, Mr. J. Denistoun, Mr. H. Macnamara, Mr. George Moore, Mr. G. Stormont Murphy, Captain Cecil Otway, and Captain Wingfield. The first convenience, in London, of the kind proposed, though not the first in England, was publicly opened by Mr. Kinnaird, a fortnight ago, in Acadia-road, St. John’s-wood. We give an Illustration of the “Cabmen’s Shelter,” and we hope that it will soon become a familiar object in every quarter of the metropolis. The committee state that each structure will not be more than 17 ft. By 6 ft., and 10 ft. 6 in. In height, on low wheels, made on a model of those in use at Birmingham and other large towns. Each is to be supplied with gas, water, and a stove for cooking purposes, and will be placed under the charge of a competent attendant. No one is to be admitted except those cabmen who have paid the small subscription it is intended to levy, which will not exceed 6d. A week, or 1d. A day each man. The rules of the committee are to be placed in each shelter, and are to be rigidly enforced. The committee think this will meet all the objections raised against former proposals of the kind. They invite contributions to be fund, however small, which may be paid at the Union Bank of London, Chancery-lane; or to Mr. Macnamara, honorary treasurer, 23, Marlborough-hill, N.W. ; or to Mr. Denistoun, honorary secretary, at the Union Club. Many shelters had books and newspapers – donated by the benefactors and publishers – for cabbies to read and provide up-to-date topics of conversation. Publications included such riveting reads as: The Graphic, Aunt Judy’s Magazine, Fun and The Animal World. Gambling, swearing and political discussion was strictly forbidden – the last condition was almost certainly ignored. A strict audit was kept on the running of the original shelters, this account from The Lancaster Gazette, and General Advertiser for Lancashire, Westmorland, on Saturday 6th March 1875 details the running costs from the first to be opened in Acacia Avenue. A Week’s Receipts at a Cabmen’s Shelter.—The third week’s receipts of the cabmen’s shelter in Acacia road, St. John’s Wood, London, are as follow:–Penny daily tickets, 280; fourpenny weekly tickets, 16. The attendant has supplied during the same period 755 cups of tea and coffee, 494 slices of bread and butter, and has cooked 133 chops and steaks and 19lb of sausages. Two new shelters are to be opened in London. The Prince of Wales – later to become King Edward VII, put in a few bob. Duke of Westminster provided Piccadilly’s shelter, but who was Mrs Braithwaite, the benefactor behind the one in Hobart’s Place? Or Miss Roget, who financed the Knightsbridge Shelter? An early architectural drawing of a typical shelter. One shelter erected in Old Palace Yard, Westminster, was paid for by members of both Houses of Parliament, presumably to ensure the politicians would never have to wait for a cab to get them home after a hard day debating in the Chamber. The first of the early shelters was opened in 1875 in Acacia Avenue, St. John’s Wood (handily for Captain Armstrong) by Arthur Kinnaird MP before a crowd of 100.